Many residents of the metro area are finally seeing the rain they have been wishing for for some time - and in many cases it's too much all at once! Strong thunderstorms are dropping heavy rain as I type across southern Shelby and Fayette counties, northern and eastern DeSoto county, and much of Marshall county. (See the image below of what it looked like on radar as I wrote this.) Currently, Flood Warnings are in effect for southern Shelby and northern DeSoto and Marshall counties and a Severe Thunderstorm Warning is in effect for DeSoto county as well. You will notice on the radar though that the northern half of the city and suburbs, like where I live (shown by the "WXLIVE!" place marker), is dry. So while half the city is staying out of the outside traffic lanes to avoid getting swept into the drainage ditch from flooding, I sit here watching some pretty nice clouds and wondering "when is my turn going to come?" If you're in the northern half of the county, you're probably wondering the same thing... rest assured, I feel your pain. If you got a bunch of rain (or if you didn't), comment on this blog and tell me how much and where you're located. I'd love to hear from you! In the meantime, I'm going to get back to work on my ark, since I have now probably asked for too much. Could Dolly be the heat-buster we have been looking for? Another day, another heat advisory... A new 2008 high temp was recorded this afternoon at Memphis Int'l -101 at 2:23pm. It may inch another degree higher before sunset. The last time MEM reached 100 was Aug. 27 of last year. You remember that gosh-awful hot spell last August right? Only 2 days that whole month was the high less than 95. At my Bartlett station, WXLIVE! recorded a high of 102.0 so far. That also sets the new mark for 2008. However, it doesn't appear that 100 degrees will show up again for the next couple of days, thanks to more clouds and scattered thunderstorms assoicated with...... Dolly?? Say it's not true! After being assured as Hurricane Dolly approached south TX last week that it would have NO impact on Mid-South weather, we were wrong again. It's true - a left-over upper level impulse that originated as Dolly moved through south TX and into northern Mexico then continued it's trip north into New Mexico and started heading east. Now it's poised to move just north of us late Wednesday and Thursday bringing scattered t'storms and some cooler temps, albeit not for long. So," HELLO DOLLY!" Once this system passes by, the upper-level ridge of high pressure looks to take hold again and we may be headed back into the upper 90s by the weekend. I found this excellent blog with a very entertaining YouTube video of Brian Teigland. The clip is typical Brian, and so funny! You have to check it out. Thanks to Ryan Vaughan of KAIT-TV Channel 8 (ABC) in Jonesboro for this posting and video "jewel." Also, Brian's memorial service will be held at Bellevue Baptist Church on Saturday, August 2, 2008 at 10:00am. Donations to the Teigland Family Trust can be made at any area Bank of Bartlett branch. I understand that Brian suffered from kidney problems for many years which prevented him from having life insurance. Please help the family if you are able. All you had heard about for today was the extreme heat that was going to be overspreading the area. Well, it would have... except we got these nice things called clouds and thunderstorms that tend to throw a monkey wrench in the works. That's what happened to portions of the Mid-South this afternoon, including the Memphis metro area. As I type, instead of it being 98 with heat index near 110, it's 77.4 degrees. The darndest thing is, the storms missed us (again) and I got 0.03" of sprinkles. I don't know about you, but I'm about tired of getting missed by the good rains. Yesterday, a deluge fell on the city of Bartlett, missing our place by 3 miles. That was our best chance yet. Today, those beautiful borderline-severe storms were just a little farther away, teasing the entire county (see radar image below). So, when will the heat return? Don't worry, it'll be here soon enough (like tomorrow). And remember, it's not the heat, it's the humidity! Take precautions - the heat advisory will be in full force again tomorrow. After writing on the passing of long-time Meteorologist-in-Charge of the Memphis NWS office Ric Coleman earlier this week, we now hear of the death of noted TV Meteorologist Brian Teigland. Brian, 53, served as Chief Meteorologist at WPTY (ABC affiliate Channel 24) and WLMT (CW affiliate Channel 30) in Memphis. Apparently he fell ill at his home and paramedics were able to transport him to Methodist Germantown Hospital where he was pronounced dead. According to his bio, Brian "...was the only Mid-South weather anchor to attend the Conference on Global Warming at the White House, meeting personally with the President and Vice President." The Mid-South weather community will miss Brian's familiar face and solid weather forecasting and reporting, particularly during severe weather events. He leaves a wife, two daughters, and a son. Please pray for Brian and Ric's families and all who knew them. More info from the MyEyewitnessNews website can be found here. This morning, Mr Richard (Ric) I. Coleman passed away after suffering a heart attack this past weekend. Ric was a true gentleman and public servant in the field of Meteorology. He retired in 1996 as Meteorologist-in-Charge at the National Weather Service's Memphis office after a long and distinguished career with NOAA and other agencies. Ric had as much, if not more, influence over my passion for weather than anyone. In the mid 1990's, as I was becoming interested in the field of weather while in high school, Ric led an Explorer Scout program in Meteorology that I participated in which effectively "sealed the deal" for me - weather would be not only my hobby, but my career path. For this leadership and guidance, I am deeply grateful and indebted. I trust that he had the same effect on many others throughout his career. Rest in peace, Ric. We'll miss you. Cat 2 hurricane Dolly came ashore at South Padre Island in south Texas early this afternoon, packing 100 mph winds and a 6-8 foot storm surge. Thanks to a jog north earlier in the day, Brownsville was spared Dolly's wrath, while South Padre and Harlingen are expected to bear the brunt of the storm. Dolly is already beginning to weaken, but will bring damaging wind, a few tornadoes, and flooding rains of 10-20" to south Texas and northeast Mexico over the next couple of days as it dissipates over the mountains of northern Mexico. Hurricane Dolly will be moving onshore near Padre Island, TX this morning. The storm has strengthened overnight as forecast and has now reached 100 mph - a category 2 storm. Radar presentation from Brownsville is pretty good and the ragged eye of the hurricane is evident. The storm will pound south Texas (Brownsville, Harlingen, McAllen, Port Isabel, and Padre Island) during the day and weaken slowly through tonight. The track takes the storm into the northern portions of Mexico tomorrow, with no affect on Mid-South weather. A couple of radar images captured about 7:30am CDT today are shown below. For an animated radar image taken at 10:20am, click here (large file: 25.5MB). For a nice visible satellite loop of the storm, click here. Above: Cross-section image through the eye of Hurricane Dolly. Note the lack of precipitation in the center of the image (the eye of the storm) and the higher precip levels on either side of the center (eye wall). Above: A velocity (or wind speed) image showing the eye of Hurricane Dolly just offshore the Texas coast. Shhhh... it's a new feature! MemphisWeather.Net is working on some new features and the first of these is in alpha (very initial) testing now. This one won't get widespread publicity on MWN just yet, so if you are reading this blog, then you'll be the first to know! MWN-TextCast and WXLIVE!-Text are the first mobile features of MemphisWeather.Net and will likely lead towards even more ways to allow you to get the great information available on MWN while you are on the go! MWN-TextCast allows you to get the latest short term forecast for Memphis by text message. For now, it is a one-time, request-reply service. We hope to add subscription based services as we enhance our product offering. Simply text 'mwnforecast' to 41411 from your text-enabled cellphone or PDA and you you will receive the latest short-term forecast straight from MWN by reply text. WXLIVE!-Text will allow you to get the current weather conditions from WXLIVE! (located in Bartlett, TN in the heart of Shelby County) via text message. The conditions are updated every 5 minutes. 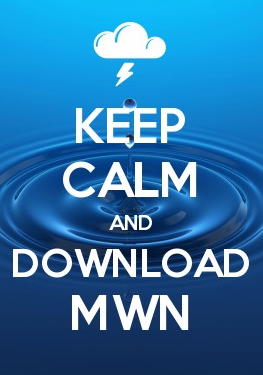 Just like MWN-TextCast, this is a one-time, request-reply service. Simply text 'wxlive' to 41411 from your text-enabled cellphone or PDA. The Heat Advisory for the entire metro area, all of west TN, north MS, and eastern AR, and the Code Orange Air Quality Alert for the Memphis area, will be in effect through Tuesday evening. Today's highs as of 3:45pm include 99 at Memphis Int'l, 97 at Jackson, 100 in Jonesboro and Tupelo, and 99 in West Memphis. The MWN weather station in Bartlett recorded 101.7 for a high! Heat indices have been hovering between 104-110 all day. This hot weather will continue tomorrow, maybe with a degree or two of cooling due to a few more clouds and isolated t'storms. Fortunately, a front will work it's way into the area Tuesday night and Wednesday, providing some relief from the heat, and hopefully a little rain! Next up, T.S. Cristobal, which first menaced the Florida's western (Gulf of Mexico) coast as a non-tropical low early last week, crossed the Florida peninsula, re-emerged into the Atlantic and picked up a little steam over the warm Gulf Stream. It has grazed the Carolina coastline the past couple of days and will spend tomorrow moving northeast away from the Mid-Atlantic coast. I expect it will have little to no effect on the mainland from this point forward. In factg, as of 10pm CDT, all coastal warnings for the U.S. mainland have been discontinued. The National Weather Service in Memphis has issued a Heat Advisory...which is in effect from 7 am to 8 PM CDT Monday. Temperatures are expected to warm into the upper 90s to near 100 degrees Monday afternoon. High humidity already in place across the Mid-South will combine with the hot temperatures to produce heat indices between 105 to 107 degrees. room...stay out of the sun...and check up on relatives and neighbors. Unfortunately, if you can't stand the heat, there's little relief anywhere close by, or even far away! Even Philadelphia is under an Excessive Heat Warning today! Highs above 90 will be found everywhere in the U.S. except in the Rockies, Northern Plains, and Pac Northwest - with 100+ temps in the Desert Southwest (which isn't unusual by the way). See the map below for today's national high temps from Weather Underground. UNTIL MONITORED VALUES RETURN TO SAFE LEVELS. FOR MORE INFORMATION GO TO WWW.SHELBYCOUNTYTN.GOV. Took these pictures about 4:45pm yesterday (7/10/08). Scattered thunderstorms were in the area and one happened to put out a nice outflow/gust front ahead of it. The gust front tracked right over the house and my weather station. As dark as the clouds were, and ominous as it looked, there was no rain with the front, though the remnants of the dying storm that initiated the front did pass over and drop 0.04" of rain a few minutes later. Pretty nice looking shelf cloud along that front. All of the classic weather conditions occurred with the frontal passage - slight pressure rise, temperature drop, wind shift and increase, followed by a brief downpour. In an effort to educate on this blog, I bring you today's topic: the importance of dewpoint. Dewpoint, as defined by the National Weather Service, is "the temperature to which air must be cooled in order to reach saturation (assuming air pressure and moisture content are constant)" (ref: weather.gov). Or, more simply, it is a measure of the amount of atmospheric moisture. Why is it important? Well, the amount of moisture in the air helps determine things like whether clouds or precipitation will form and how "humid" it feels. Frequently in these parts, you'll hear someone say, "the humidity sure is high today." What they are talking about (maybe without knowing it) is how humid or sticky the air feels, as measured by relative humidity. Relative humidity is calculated using the temperature and dewpoint. Based on the definition above, if the temperature is 85 and the dewpoint is 65, that means the 85 degree air must be cooled to 65 for it to be saturated (or to reach 100% relative humidity). Therefore, the relative humidity can be calculated (using a formula) as 51%. It is very important when forecasting temperatures and humidity to know what the dewpoint will be as well. In fact, it is so important, that it is one of the parameters I keep accuracy statistics on when making my forecasts. When I write a forecast, I always also forecast dewpoint, even though it does not appear on my actual forecast page. It is very helpful in knowing what a morning low temperature will be (the temperature can never fall below the dewpoint, otherwise humidity would be above 100%! ), what the heat index will be (temperature and humidity are used to calculate heat index), and how much moisture is in place to feed potential thunderstorm development. It's also important to know the temperature and dewpoint spread above the surface (if temperature and dewpoint converge, the humidity nears 100% and clouds form at that level). Is it a tornado? Is it a dust devil? No, it's a gustnado! Interesting phenomena going on this afternoon. The NWS-Memphis has issued a couple of Special Weather Statements (SPS's) alerting the public to the possibility of non-tornadic funnel clouds emanating from airmass, or pop up, thunderstorms. Earlier in the afternoon, one was issued for central Mississipi County, AR, and at 2:56pm, an SPS was issued for SE Fayette County and SW Hardeman County, TN. The NWS wording was "DOPPLER RADAR INDICATED A THUNDERSTORM CAPABLE OF PRODUCING SMALL SPIN UP CIRCULATIONS ALONG A GUST FRONT. THESE SPIN UP CIRCULATIONS MAY FOCUS GUST FRONT WINDS TO SPEEDS NEAR 50 MPH." Commonly refered to as gustnadoes, this phenomena looks similar to dust devils or funnel clouds in appearance and are typically found along thunderstorm outflows, commonly called gust fronts. It is rare (around here anyway) to see the NWS alerting the public to these, but obviously there are reports of funnel clouds coming in to them. Obviously they are not as destructive as tornadoes and they are also very often short-lived and small in size. Their main distinction from tornadoes is that they are not usually attached the the base of a parent thunderstorm, more often just "spin-ups" along an outflow boundary. For more on gustnadoes, visit the Wikipedia site on them or see this YouTube video. As of 5pm EDT, Bertha has proven just how hard it is to forecast storm intensity. Six hours ago, NHC was forecasting a slight increase to cat 2 strength. All of a sudden, Bertha has taken on new life and jumped to Cat 3 with 115 mph sustained wind! For the latest satellite imagery loops of Bertha, click here (anytime) or here (daytime only). Big Bertha! The first hurricane of the 2008 Atlantic season has formed and is crossing the Atlantic - a rarity for this early in the season. Most tropical systems this time of year form in the warm waters of the Caribbean or Gulf of Mexico, with Atlantic-crossers not starting until the middle of the season. As of this 11am EDT, maximum wind is 90 mph (80 kts) in this storm with a forecast for some additional strengthening to Cat 2 status. In the next 48 hours, Bertha will encounter a trough over the western Atlantic which will serve to turn it more towards the north and also likely cause it to start a slow weakening trend as it encounters more atmospheric shear compliments of the trough. Right now, it is too early to tell whether it will have any impact on land, though Bermuda would seem to be the mostly likely possible victim should it maintain it's forecast track into the latter stages of the week. A forecast track map is below. On another note, the scattered storms over the weekend missed my rain gauge! WXLIVE! recorded only 0.01" of rain over the weekend. Some areas particularly in eastern AR, northern MS, and south of I-40 in west TN (including parts of Memphis) got healthy and much-needed downpours. In the meantime, the grass wilts at my house and more heat this week will not help. Highs all week and next weekend will be in the mid 90s except possibly Thursday and Friday when daytime scattered t'storms could help to hold the temps down in the 90-93 range. Heat indices will be from 99-103 on days without rain as well. After several cooler-than-normal days, low humidity, and beautiful evenings and early mornings, the atmosphere is getting primed to provide some of Mother Nature's fireworks for the holiday weekend. A slow-moving, weak cold front will drop into the area from the north late tonight and hang around through Saturday. In the meantime, high pressure has shifted east and the clockwise flow of air around the high is bringing humidity back to the Mid-South on southerly wind. By tonight, as the front makes it's approach and humidity continues to increase, a slight chance of showers or t'storms will crop up, particularly after midnight. Any fireworks displays this evening will be man-made and should remain dry! By tomorrow, look for storms to become more widespread, with a 50/50 chance of rain for the entire area. Scattered thunderstorms will continue into the evening so bring an umbrella for any July 4th events you plan to attend. Scattered storms will continue Saturday as the front hangs around before lifting out Sunday with rain chances decreasing by the end of the weekend. A return to hot and humid weather is on tap for the beginning of next week.